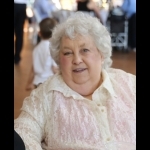 Dorothy Frances Rogers, 83, of Merriam, KS, passed away Tuesday, August 7, 2018. Visitation will be 1-2:00 PM with Funeral Services starting at 2:00 PM Sunday, August 12, at Porter Funeral Home, 8535 Monrovia, Lenexa, KS. Dorothy was born March 1, 1935 in Polo, MO. She was a loving mother, grandmother and sister. Dorothy gave a hard fight to the end. The Lord was ready to take her in his arms and give her peace. She will be missed dearly. She was preceded in death by her husband Lloyd. Survived by children: Diane, Cynthia (Dyas), Dottie, Opal (Rob), Lloyd, Gerald (Corinna), stepchildren Wayne & Brenda, siblings: Helen and Irma, Joe, George, Kenneth, Harry, Morris, 24 grandchildren, 21 great grandchildren.